In every company there are people who love a cup of tea or coffee. In every company somebody is responsible for buying the milk for those beverages. Milk is not free so everybody needs to donate. 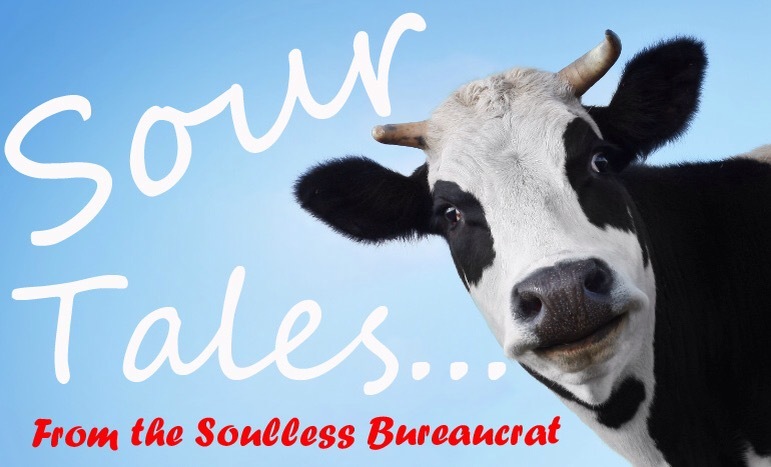 One man has made it his business to make sure you do, and his name is, The Soulless Bureaucrat, and these are his Sour Tales. I did not send a request for the last few of months so I’m asking for payment to the end of September. I’m requesting payment for the months up to September now: for most new members that’s the period from June – September i.e. £8. For others, it’s more. The Milk Fund remains solvent. Just about. Since my last email some members of the milk club have gone to a better place. They have not expired. They have simply moved to the dizzying heights of the 5th floor. These are mostly members of the DITC, who moved in mid-May. Apparently, they have something called ‘sunlight’ there. The rest of us Morlocks continue to toil away in the shadowy cauldron-like purgatory of the 1st and 2nd floors. This will therefore be my final missive to (former) members of the milk club now resident on the 5th floor. I have still to write to individuals to request final outstanding payments. I just haven’t got round to it. We wish them well. For many of my emails I’ve railed against milk theft. However, perhaps our sympathies should really go to these milk thieves. These intrepid pilferers make the journey from their desks to the kitchen seeking ‘free’ milk. It got to a point when these individuals made their sorties only to discover it had ran dry. Of course, such is the mind-set of the milk thief, they would refuse to believe that their act of theft could have contributed to the running down of the supply. Therefore the bottle was never thrown away. These individuals would then have to return to their desks in a state of mild confusion at how this seemingly eternal bottle had ceased to deliver any further milk. I witnessed one regular offender. He entered the kitchen. He filled the appropriate hot water from the dispenser and then went to extract his milk armed with his mug, a smug smile and his customary sense of entitlement. He opened the fridge and found himself staring at the empty shelves. One might have expected him to close the fridge door at this point. However, he simply continued to look expectantly at these shelves, perhaps imagining that if he stared for long enough some ‘free’ milk would appear. However, none came. The dirty white abyss of the fridge stared back at him and only served to reflect the emptiness of his own soul. Finally, he closed the door and trudged back to his desk. 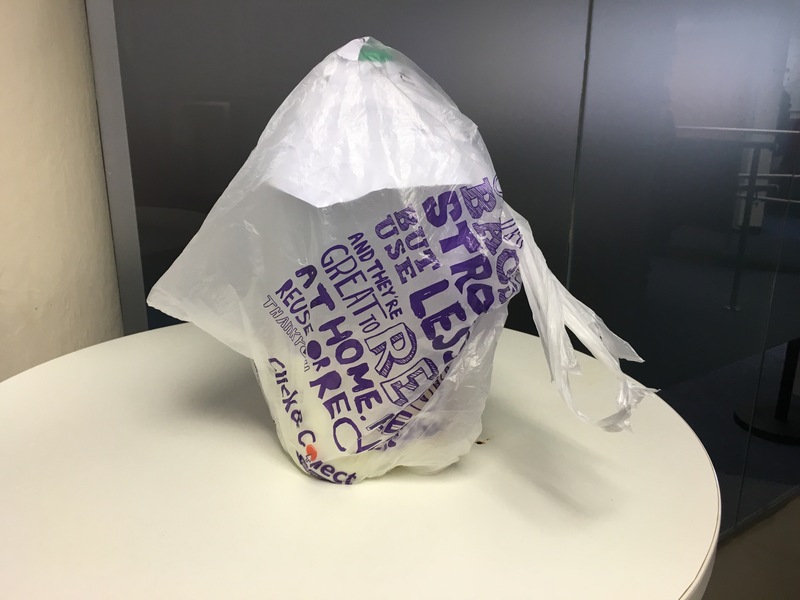 Note: It is important to re-tie the knot after use (ensuring that the bag covers the lid) as a means of preventing ‘milk pilfering’, which is the single greatest threat to milk solvency. It is the duty of every milk club member to ensure the security of milk. I have mentioned this before but another great threat to solvency is cereal eating. The milk club is for the supplementation of hot beverages, only. Cereal eaters should buy their own milk separately or use water. The Milk Fund remains solvent. The Milk Fund has bid goodbye to some of its members – many of the City contracting team fled to/sought refuge at the Costa Del Sister Company. In other news Milk thieving continues unabated. There is an understandable lack of willingness to confront milk thieves. Therefore a more passive-aggressive approach is advocated. On witnessing an act of milk theft: milk fund members are encouraged to lock the offender in a malevolent stare; to then point to the milk fund members list and then shake one’s head in a disdainful manner. Note: It is imperative to maintain a malevolent stare. A stare without malevolence is likely to appear simply vacant. Rather than feeling cowed or shamed perpetrators are likely to enquire as to whether the starer is ‘feeling alright’? If you feel your stare lacks malevolence please practice in a mirror beforehand. The Orbit time portal has been introduced. To coincide with this the as of the 1st of July the Milk Fund has launched its Milk Usage recording system. This was after a lengthy pilot programme. The pilot actually took the form of a surveillance exercise where some members of staff were ‘monitored’ in their daily visits to the kitchen. Some of you will have felt the creepy sensation that you were being watched – that’s because you were. Members of the Milk Fund will be required to record the time used for different tasks and the quantity of caffeination required to complete tasks. To illustrate further, Sherlock Holmes referred to the case of The Red Headed League as a ‘3 pipe problem’. Whilst the Milk Fund does not endorse imbibing the same infusions as Holmes in order to aid solution of work-related problems; certain tasks naturally place similar demands on caffeine (and by extension milk) resources. i.e. Who among us has not been confronted with a ‘2 cuppa spreadsheet’? Others will similarly have found themselves requiring several coffees to sustain them through soporific meetings and mandatory training sessions. Members of the milk fund will therefore be required to complete a daily record of milk/caffeine consumption. This will require Milk Fund members to account for all caffeine/milk based beverages against the tasks/meetings they are required to complete. This will involve listing individual tasks and then selecting a ‘tedium rating’ on a scale of 1 to 5. This will then be followed by totalling the required caffeine/milk based beverages required to complete the task. This will be a daily mandatory requirement. At the end of the month: the Milk Fund will collate none of the information and make no decisions based on this empirical evidence. The Milk Fund will instead continue to make decisions based on its own prejudiced attitude, applying its ongoing low opinion of the human race. Request for funds to the end of December. Rachel’s willingness to testify in open court against ‘Milk Thieves’ earned her a spot in the Milk Fund’s Witness Relocation Programme. She is now living an anonymous existence in an undisclosed location under a new identity: although her choice of new name, Anastasia Von Pommelhorst (IV) appears less than entirely inconspicuous. The notorious “security bag-tearer” on the 3rd floor remains active and at large. It should be noted that this individual only tears the bag on certain days of the week. This suggests a possible Jekyll and Hyde type character: An individual who is usually able to pilfer milk on a sneaky basis, but on some days (possibly when the Northern Line/traffic is severe), undergoes a “change”. This individual is therefore likely to be a senior member of staff. Over time this individual has likely developed an air of entitlement; regarding others as his feudal serfs over whom he has dominion. He therefore believes that what is theirs is his. This enables him to calmly tear the carrier bag without any pang of remorse. 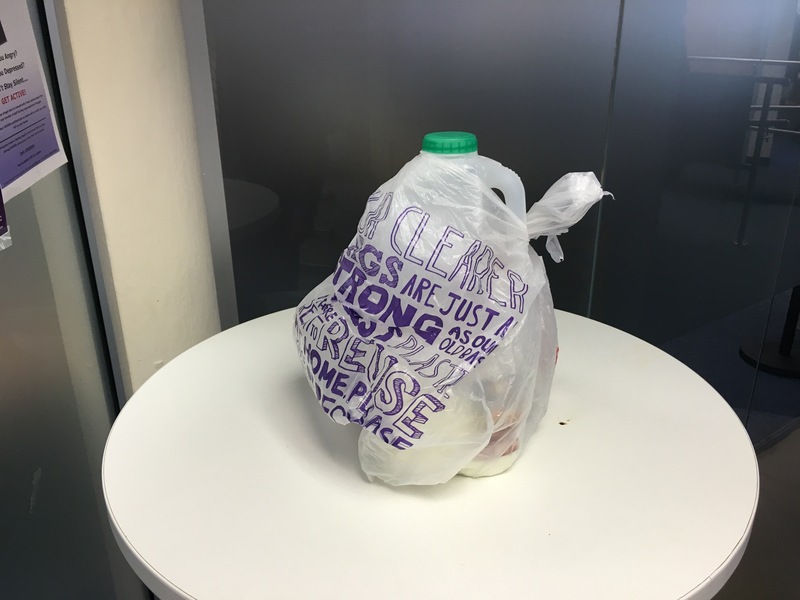 However, even more degenerate than the ‘carrier bag tearer’ (difficult to imagine, I know) are the people who screw the cap on over the bag. This then causes milk to get into the bag. If any of you are doing this please refrain doing so in the future as it is disgusting. If you identify a milk thief you are advised to hiss at them as they walk by or spread libellous gossip about them. The milk fund endorses the practice of rumour-mongering; as well as malicious hissing. If you feel you will be unable to engage in these practices; courses will be available. 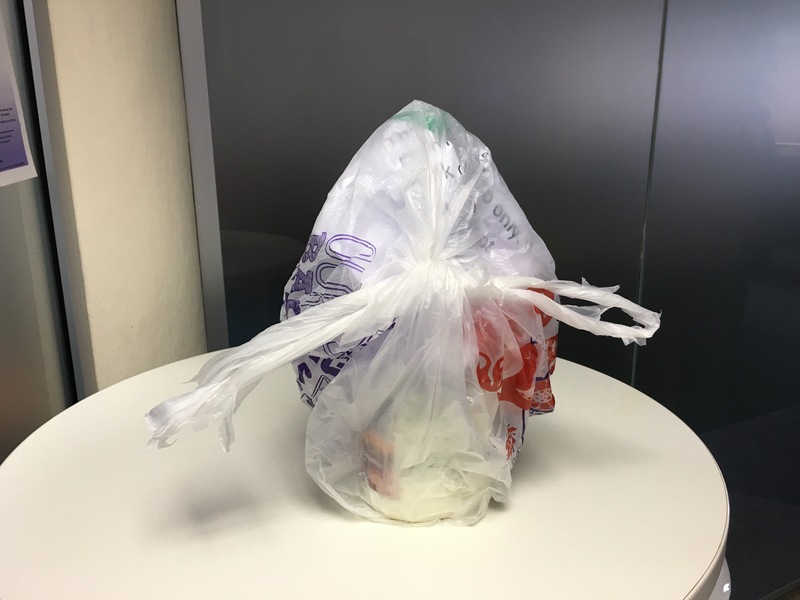 Note: It is important to re-tie the knot after use (ensuring that the bag covers the lid) as a means of preventing ‘milk pilfering’, which is the single greatest threat to milk solvency. Please see instructional video below. Some people have had difficulty in tying the carrier bag around the bottle in a secure way. If this persists I will have to introduce a mandatory bag tying training seminar; failure to complete training will result in cancellation of membership. Another threat to solvency is cereal eating. This should also serve as a reminder that some of you have yet to pay for July and August. Many of you will have seen notices promising ‘free’ tea and coffee via email and on notice boards. None of these have made any mention of milk provision. There was talk of free milk provision. So far this has proved to be nothing more than talk. The milk fund members are a grim-hearted cabal for whom seeing-is-believing. We have long abandoned those hopes of sunlit uplands comprising free milk provision. Milk thieving itself is becoming even more blatant. Whereas last month someone artfully cut a small hole in the bag to obtain access; this month someone just tore the bag open. Having referred this case to CrimeWatch the following results have come back. We are looking at 2 distinct groups of thieves with very different psychological profile types. The first is skilful and calm under pressure (possibly also carries out safe-cracking in their spare time). The second is likely short-tempered and possessed of greater physical strength. The second personality type is likely to be furtive; have bulging psychotic eyes, and possibly does not tuck their shirt into their trousers correctly. Members of the Milk Fund are advised to avoid confronting the second personality type. Unfortunately, the e-fit photograph was unclear: therefore an arrest and conviction are unlikely. Request for July and August funds. Yes I’m making a request for calendar month of July and August funds. I’ll be making a request for September funds later this month. I have been on annual leave intermittently throughout August so have not been able to send my usual email for July or August. In my absence Pam once again stood in the breach to ensure milk was purchased. Some of you have already paid for the month of July. Rest assured: my spreadsheet knows who you are. A list of current milk club members can be emailed to you. Some of you are on the 2nd floor; some on the 3rd floor. Note: if you are a member of the milk fund you may partake of the milk on either floor. E.g. imagine someone from the 2nd floor who finds themselves in the exotic and dizzying heights of the 3rd floor. Though they may find themselves amongst strangers they will find the Milk Fund’s warm embrace reaches them there. Simply look for the bottle with the childish handwriting from a cheap biro on an even cheaper post-it note. Please refrain from doing this as it is disgusting. In keeping with our ‘snitch-a-colleague’ scheme, please report suspected milk thieves to me. Whilst I won’t take any real action; a campaign of hissing and evil stares will be initiated against these people. This is intended to achieve nothing, other than making me feel slightly better. Refer to my previous email for the instructional video demonstrating the correct way to do it. Failure to complete training will result in cancellation of membership. The milk club is for drinkers of beverages, which require the addition of milk, only. Cereal eaters should buy their own milk separately or use water. Could you all please pay the £2 for the month of February at your earliest convenience? If you no longer wish to be a member please send me an email. The Milk club is under serious threat! The milk is being lain siege to by milk thieves. People have been using the milk without paying for it. These are people with little or no social conscience. They may rationalise their thefts by believing it to be a ‘free’ service. You may be able to identify them, as a milk thief will likely be decidedly ugly. This is due to their withered souls having ravaged their faces. The thefts have been substantial and may cripple the financial solvency of the fund. If these thefts are not abated the cost of membership will need to rise. The real price of liberty (of drinking milk) is eternal vigilance. In lead up to your training I have included a short tutorial video, I suggest you watch it at your earliest convenience. Another major threat to solvency is cereal eating. Anyone caught doing this will have their membership immediately terminated. Eat Cheerios at your own risk. Could you all please pay the £2 for the month of January at your earliest convenience? Please note that if you cancel your membership you will not be entered into any of the monthly prize draws in which fabulous prizes (i.e. used carrier bags) can be won! The Performance Team milk club now has 14 members. i.e. 3 new people have joined since last time. If this persists I may have to introduce a mandatory bag tying training seminar; failure to complete training may result in cancellation of membership. Below is a photograph displaying the correct way to tie the knot. Front angle of the knot. The milk club is for drinkers of beverages, which require the addition of milk, only. The milk club remains solvent. New members are not required.